Bec: It was pretty good because the morning sickness had passed, it was really intense, but for a shorter period of time. It was the same with Cruz, so I was convinced Ava was going to be a boy. 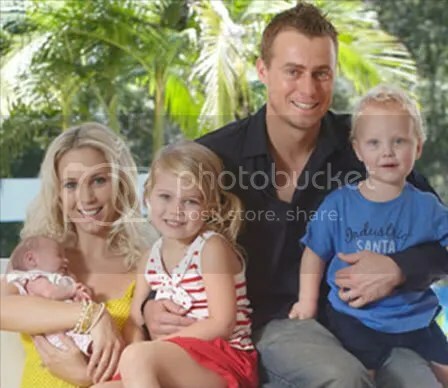 Lleyton: No, but our gut feeling was that it was a boy. B: So that was a nice surprise in itself. B: No! And Lleyton wasn’t actually here. He was in Melbourne. L: But I got there! B: I was feeling average; I was vomiting through the night and was hot and cold. When I go in to labour, I get a backache, but because my whole body was aching, I really thought I had a virus. L: She rang me in the morning and said, ‘I’ve had a rough night. I’m not sure what’s going on,’ I wasn’t sure if I should hop on the next flight back to Sydney or not, so I called the obstetrician [doctor]. B: He said to come to the hospital and with a bit of rest, we could slow it down. B: I was in a warm bath and that was helping me feel much better, but as soon as I stood up, it hit me fast and I said, ‘We’re not slowing this down. There’s a baby coming! The contractions became regular and were getting a lot more severe — and I guess having two kids before, I just knew. B: [A natural] with all three so far, that’s good. B: She seemed well and she was able to feed straught away. She is classed as a premature baby, so they definately made a really big fuss about it in the hospital. Before every feed, they took her blood sugar levels, and also wrapped her up so much that I thought she was too hot. But they said premmie babies use too much energy if they get cold. L: As soon as she came out, everything seemed fine to me — just like with the other two. The difference is she sleeps a lot more because [premmie babies] need to catch up on the growing they do in the womb. B: It’s made adjusting to three a lot easier — with all the sleep we’re getting! L: We’ve liked the name for a few years now and we’ve always had Sydney as the middle name. It’s a really nice connection to where she was born and also where we got married at the Sydney Opera House. B: Mia has Rebecca and Cruz has Lleyton, so we wanted Ava to have something special. L: Mia was ecstatic. Mia and Cruz were the first two people to come in to the room and see her. And we always promised that [Mia] would be the first person to have a proper hold of her. B: And to announce to the rest of the family if it was a boy or a girl. L: She wanted a baby sister so badly, so we warned her that there’s a very good chance it could be a boy — but when she saw it was a girl, she was over the moon. B: And Ava looks like a little Mia. L: Mia got the first proper hold on the couch by herself and just loved it. And Cruz can’t stop hugging and kissing her. B: He can’t stop hugging and kissing her. He’ll be a lovely big brother. B: I feel so good; I can’t believe it. I should be feeling uncomfortable and still having a tough time sleeping, but I’m bouncing around. I feel really good. L: We love it. I can really relax after a tournament and have time out with the kids and do normal things. Mia loves building sand castles and running on the sand, and Cruz loves the water — he can’t get enough of it! He’s a really chilled-out kid. He actually suits the Bahamas. B: We’re homebodies. We just love being with our kids. Even when we’re not with the kids we talk about them. Source: OK! Australia, Issue Date November 22nd. Photos OK! 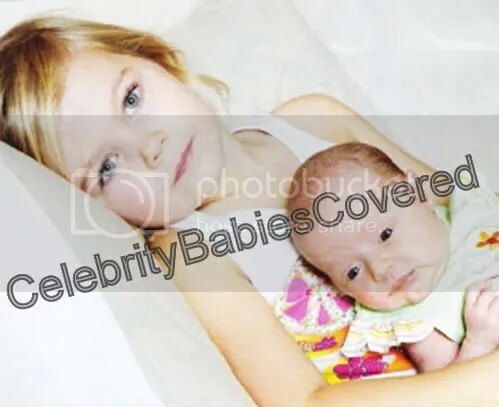 This entry was posted in Baby Photos, Child Photos, Cover Stars, Dad and Baby Photos, Dad and Child Photos, Interviews, Introducing, Magazine Shoots, Mum and Baby Photos, Mum and Child Photos. Bookmark the permalink.